Discussion in 'Miscarriage Support' started by Fairy_Girl, Aug 9, 2007. Ok so first of Hello!!! Second of all my husband and I have been TTC for a few months now and so far had no luck. I had my last period on the 9th of July so I'm officially about a week late. Took 3 HPT's and they were all positive, went for blood work today and my doc said that it was high for only being 3 to 4 weeks pregnant (Beta's were in the 6,000's) I know I cant be father along and I have been told it could mean multiples. Kinda a scary thought for us but id welcome it. But then a friend told me that it could mean an ectopic pregnancy!! She has me all worried now and I'm trying to find information. Can anyone help!!! An ectopic usually has low hCG counts that rise very slow & stand at static. Mine didn't go above 500 tops (can't remember now). Ok even that chart says somewhere between 5-426 but I'm up in the 6,000's at the most I'm only 4 weeks, Should I still be concerned about multiples??? Maybe I just don't get the way the numbers can vary lol I'm going to pull my hair out with this mess!!! 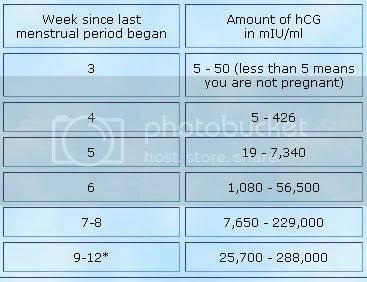 These things are only guideline but one thing for sure is your not below the hCG levels expected plus your closer to 5 weeks than 4. It 'could' mean twins or more hehe but defo ignore your friend Ooooo an stay away from good old Google lol Drive you MAD even more < It did me! Thanks lol Google is so darn right addicting. I'm going tomorrow to actually see my doc and actually try to figure this whole mess out although she says its too soon to see much on an scan. I wonder if she can tell if its more than one baby by feeling my abdomen like they do during the exam??? Thanks Wobbles!!! Trying to think positive thoughts and staying away from Google!!! Ah good luck. Im glad Wobbles has managed to put your mind at ease! Hiya and welcome to BabyAndBump!!! Your friend is talking rubbish! i had static HCG levels With my epotpic in december. congratulations and have a happy and healthy 9mths!! P.s also agree - stay away from GOOGLE! lol yeah I didn't listen very well I decided to look around some Twin sites and they pretty much scared the hell out of me but they helped me realize how close my story is to theirs. I had my Betas checked again today and they have more than doubled in 24 hours. My doc wont give me an ultrasound unless I have to have one because I'm on government health So I guess I have to wait to find out if its twins but my gut tells me it is. Where are you from hun? yeah youre still welcome hun... we have some crazy USA members!! lol thanks!!! Ill be willing to join that crazy USA members group!! I can be a tad crazy every now and again!! Right now my mind is in a million places though!! The crazy one is 'Suz' lol Shes our US Mod so you've come to the right place Just we have UK US & the odd member from other places. Your levels look great , as long as they double every 2-3 days then things are going to plan lol.